She loves to bake cupcakes and planning create a profit out of it. This is a plugin for users who are planning for starting food business and ideal for cooking and baking websites. Create recipe post types, add ingredients with measurements, costs and the number of servings that it’ll make. 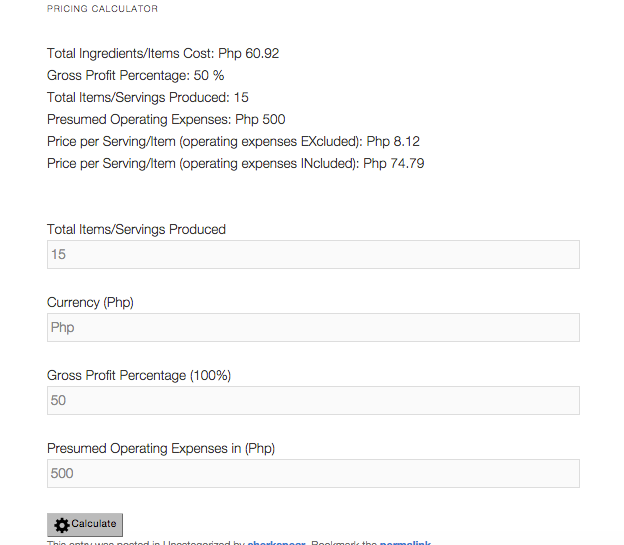 Calculates price per serving or pieces given the Gross profit. Users may provide instructions on how to bake or cook the menu/pastry using youtube videos, images or text inside body textarea. User’s also provides date that the calculation may expires due to price adjustments. 1. Backup everything before you install the plugin. 4. Update the Permalinks on settings. 5. At Dashboard, add Recipe post type. 6. Add Title and at Body textarea , provide photos(much better) of the food or dessert and etc with description and instruction on cooking or baking.Then submit. 7. Click View Recipe to add ingredients, measurements, ingredients’ cost. 8. 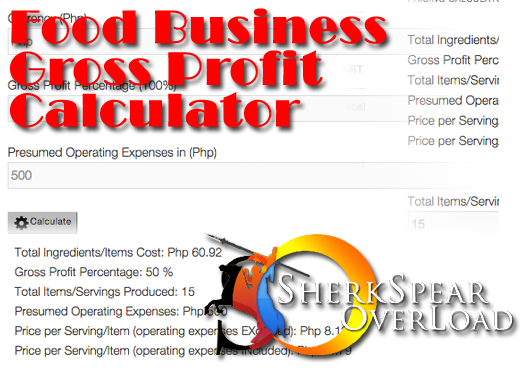 Provide values on the fields for the Price Calculator depending on the Gross Profit Percentage. 9. You can add Recipe Categories under Recipe Post type. Certainly and would love to hear about it. You can contact me through my official website http://www.sherkspear.com or contact me through email sherk_wing20@yahoo.com.